Wow, I can’t believe the year has past. It’s a wonderful time to sit back and reflect on what an amazing year it has been this year. A little over 12 month’s ago, I made a huge leap from working as a Senior Associate in a busy accounting firm, to following my heart and focusing on my photography business and my family. I can honestly say I would not change it for anything. Working on your own business instead of for someone else has definitely been a huge learning experience and every day there is something new to learn. But even so, I have loved every minute. My first Silver award at the Australian Professional Photography Awards in the Birth Category. This was the first time that birth photography had it’s own category at the awards and it was such an honour to have one of my images recognised as being exceeding professional practice in this exciting area of photography. I have to say, that being present and documenting the birth of a new baby into the world, would have to be one of the most rewarding experiences and I can’t wait to document more births in 2015. Becoming a fully accredited member of the Australian Institute of Professional Photography (AIPP). While I have been an emerging member of the AIPP for a few years now, I have spent time this year being mentored by a member of the AIPP and applied for my full membership and received confirmation in December that I was now fully accredited. This has been a dream of mine for a while now and I feel so proud that all of my hard work has paid off. What does this mean for my clients, that they know that the photographer they have chosen is trained, educated and skilled as a professional photographer. I am very much committed to continuing my education and training going forward and providing each and everyone of you the highest level of service that I can. In November this year, my husband and I signed the lease on a commercial premises to operate Mary Wheatley Photography from. This is still a work in progress as we are working hard to creating a beautiful space that will be used for all my newborn photography work, to meet with beautiful clients to get to know each other and discuss their wedding plans or their birth plans, to show all my wonderful clients their gorgeous images and work with them to create some beautiful wall and display art pieces for them to enjoy in years to come. None of this would have been possible without the love and support of all the wonderful people that I have meet over the last 12 months. I cannot thank you enough for allowing me to be a part of your lives and create some wonderful photographic memories for you all. Each and everyone of you have enriched my life so much and for that I am so thankful. So here it is my 2014 Year in Review, all the wonderful people I have had the pleasure of meeting and photographing this year. I am so excited for 2015. I know it will bring so many more new people into my life and some returning ones as well. From welcome a new baby into the world, celebrating the joining of 2 people in love at their wedding, and having fun hanging out with some wonderful families, I can’t wait to meet you and get to know you and to create some beautiful photographs to remember these special times. 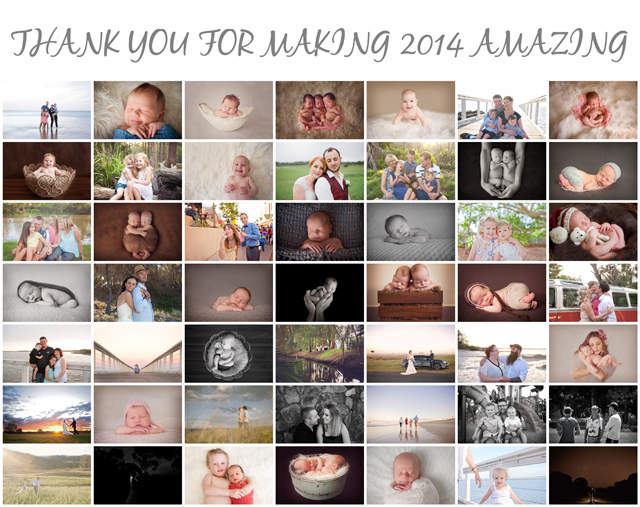 If you are looking for a photographer for 2015 or beyond, bookings are now open and I would love to hear from you.